It's been awhile since I've done a developed watercolor on good watercolor paper. It's also been a good while since I've shown various stages of a watercolor in progress. 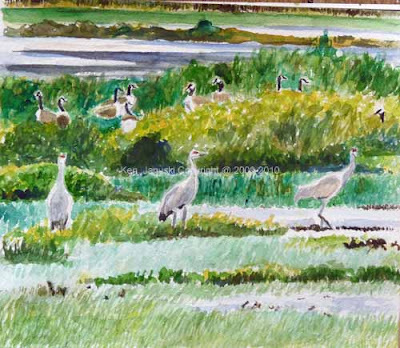 So here's a series from my new watercolor of some Sandhill Cranes and Canada Geese at Horicon Marsh. I saw them last fall. I've really enjoyed the quick watercolors I've been doing for months now. But I felt like it was time to try something more ambitious. I'm sure that aome of the painterly freedom I picked up from the quick watercolors shows up here. I've spent about 6 hours on it now and it's time for a break. My guess is that it needs at least some more work. But I've been known to ruin a work by overwork, often when I've worked on it too long already. So for now I need to take a break from this and come back to it with fresh eyes. You never know where you'll find inspiration, or interesting birds. We try to visit my sister and my brother in law every year in central Illinois. Since they know we have an interest in birds they will often try to find a day trip that they think we might enjoy. Last fall we went to Homer Lake State Park. We really didn't find much. But there was a fairly new wetland that was just being developed. I think we saw one bird and a few, large frogs. But the one bird was a Green Heron whose head took on the most spiky, punky look I've ever seen on a Green Heron. I took a number of photos and did drawings based on them a few months ago. The appeal is still there. As I browsed old photos today looking for the subject for another quick watercolor those photos jumped out. I got a little carried away in trying to work quickly and ended up getting rid of some white areas that I wanted to keep. But I've also gotten a little more comfortable with sneaking in a little white gouache to get it back. Those were the last steps here. As I said we aaw a number of large frogs here as well. In the back of my mind I'm wondering about the possibility of combining the two in one more developed painting. We shall see. Either way that unpromising little wetland has proven very fertile for me. Well this one was a hard one to title. Should it include 'smellovision'? Was 'ethics' too strong? For the last week or so there has been an overpowering smell in my studio, which is a room in our house. My first reaction was that it smelled sweet like lilacs. But my wife thought it smelled more like the sickening sweetness of the spray that professional exterminators use. Because it reappeared as strongly as ever from day to day I wondered if our new cat had decided to spray near the door to my studio. Not just spray but spray with his own unique sweet smell. Those are the more reasonable explanations we came up with. Among the others: had our neighbors, with whom we have a common wall, spilled a bottle of perfume? Were they burning incense 24 hours a day? It was driving my wife and I nuts but especially me since it was concentrated in my studio. Then today I went to water some 20+ year old plants that I have, and have properly neglected for years. One thing I've learned with houseplants is that they thrive on neglect. No chance of overwatering if you forget that they are even there! As I looked up at one of the plants I found a foot long flower in full bloom! No wonder it smelled floral to me. This plant is really old, bought when I paid more attention to house plants, which was at least 20 years ago. I thought it was a 'corn plant.' So I looked it up on the web: 'dracaena frangrans', with the fragans noting fragrant! But this plant is 20 years old at the youngest. Why did it decide to bloom now for the very first time? Well there you have the 'smell' of my title. What about ethics? Well I feel like I really need to get to work on some more developed paintings and maybe drawings. But I'd like to do some more ambitious works on better paper. I got up earlier today and thought I might do so this morning. But then there was this once in twenty plus years flower staring me in the face. And I've been saying that I wanted to work more from life, especially with watercolor. It almost seemed unethical to pass up a chance to draw from life something that I'd seen only once in twenty years. You see the results. I'm more or less happy with them. It's sure better than the horrible flowers that I drew from life with watercolor pencils this spring. I did sketch this out first, but then did a fairly loose watercolor. I'm starting to accomplish a goal of mine: paint whatever I see from life that is interesting to me in watercolor on the spot. That's what I did today! My ambitious painting/drawing will have to wait. I'm sure I've gained more confidence in my watercolor skills by doing this instead. Today is Mozart's birthday so the local classical and jazz radio station, WRTI, is playing his music all day. 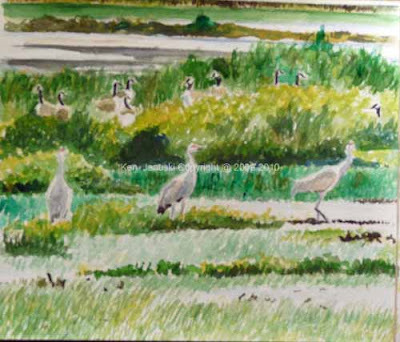 It was a welcome accompaniment to my sketches of Dunlins and Greater Yellowlegs, most in flight, at Heislerville WMA. These and all the sketches here are based on photos I took over the last year. I use doodling in the title here because although these are studies as well and try to be accurate they're also a type of subconscious artistic stretching. 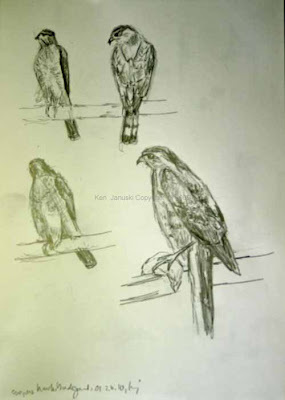 I draw what I see but in the back of my mind I'm exploring what might be done in more developed works with the various birds I sketch. 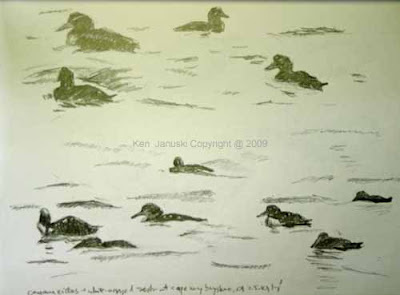 Included are Dunlins, Greater Yellowlegs, Common Eiders and Scoters, Coopers Hawks and a Brown Thrasher. They were done over the last week. Sometimes when I know that I won't really have more than 30 minutes or so to devote to a painting I flip through the many bird photos I've taken and something will strike my fancy. I don't yet have enough field studies to do the same with them but I hope that will happen soon. This sometimes results in surprising subject choices. Today's painting is a sunset, something I've never liked, even when I lived on the Pacific Ocean in San Francisco. I'm not fond of sunsets or artworks based on them though for different reasons. In nature I find sunsets somewhat melancholy. In art they're most often cliched, or at least they strike me that way. Nonetheless a sunset photo of one of the ponds at 'The Meadows' at Cape May caught my eye a few days ago. We often visit Cape May in October and by the time the sun sets at The Meadows it's pretty cool. Often the water just looks plain cold! But since I've been veering off from birds a bit recently I decided to use it as a subject. 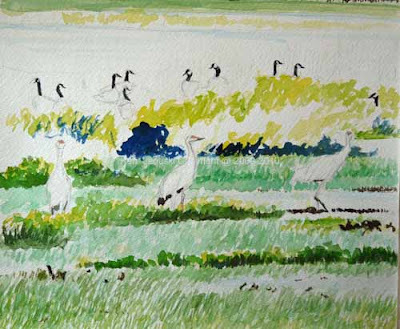 There are Mute Swans and Great Egrets in the picture as well as a few unidentified ducks. But the subject is really water, light and sky. These are all parts of the environment of many bird scenes so I decided to go ahead and try to paint them, just as with the trees, mountains and sky of my last post. I continue to try to learn more about painting in watercolor, both in technique and in subject matter. So that's the explanation of my 'sunset painting', probably the first I've ever done in my long career. As I did it I was reminded of an event when I was probably 10-12 years old. I'd been doing art for awhile and thought I had some talent. Then I visited an older cousin who showed me his painting of a sailboat in the water at sunset, complete with reflection, blues, pinks, yellows. I was devastated. I knew I had never done anything that good and probably never would. The illusion of light was a revelation! I doubt I'd feel that way now. More likely I'd just say: 'Oh, another formulaic sunset. Look at those predictable pink highlights.' But at the time it indicated a level of sophistication in art I never even thought possible. So there you have it: my first sunset. More than a sunset though I'm trying to capture some sense of the coldness of that scene. It was beautiful in its way, but really more a scene of hard coldness than anything else. I think this gets some of that. I also have to give credit to Aquabee Super Deluxe Sketchpad here. It's really not meant for developed watercolors. But I worked for three days on this and it's still in one piece, though a bit warped. One more thought: you might ask why a 30 minute painting took 3 days to complete? Well I didn't expect that it would. 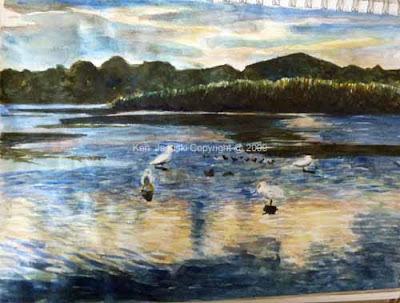 But once I started I decided that I didn't want to use broad brushstrokes for either the water or the hills. So they were done slowly with many small strokes. 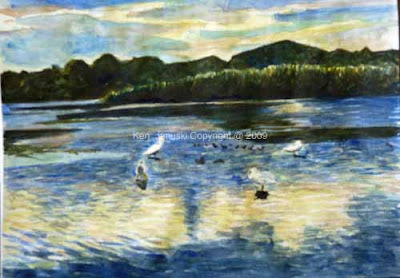 As the painting developed I then used a broader brush to unite some areas. But everything began with the slow work of small brushes. I have tendency to use a 'broad brush'. But sometimes I regret the lack of detail. So I started with a small brush and many brushstrokes on this one. Below is another photo of the watercolor. It's off center but the colors are a bit truer. That's what the Chestnut Oaks do, at the top of Shenandoah National Park, where we stay in a little cabin like the one pictured here each spring. When you're under these lichen-covered trees in early spring they seem magnificent, tall and swaying in the wind, always attracting breeding and migrating songbirds: warblers, tanagers, grosbeaks, flycatchers. They eat the tiny caterpillars that eat the newly emerging foliage as well as the moths that try to hide against the complexly colored bark. Then I take a photo to capture this. Dullsville! Particularly the tallness of the trees seems to absolutely disappear. They look puny and uninteresting. The watercolor, with white gouache, here is my first attempt to capture those trees in paint. I'm disappointed, I think particularly by the sense of scale. Putting the cabin smack dab in the middle of the painting wasn't smart either. The colors are disappointing though somewhat accurate. But I do want to work more on trees, sky, foliage, because they're all an important part of the bird paintings that I do. This is a start in that direction. The very last page of Darren Woodhead's 'Up River' has the acknowledgements. It's not often that you find any pearls of wisdom in this location. But here you do. He thanks his tutor at the Royal College of Art, John Norris Wood, for telling him 'just use colour direct in brush', thus determining the subsequent style of his work. And a striking and beautiful style it is, painted watercolor with rarely any sign of pencil drawing. There's of course nothing wrong with pencil drawing and some of my favorite watercolor artists, e.g. Winslow Homer, use it. But it can also be inhibiting and restricting, something that holds you back from using the full expressive powers of watercolor. I think most truly accomplished artists of whatever sort can claim that their artistic instruments become extensions of themselves, almost like an extra limb. That is true for me when I'm drawing. Whether it's pencil, charcoal or pastel I feel like I'm wholly connected to it. It's not a foreign object I'm holding in my hand. Not so with brushes and watercolor though. The brush often seems like a foreign object, whose directions are in a foreign language. It was only by happenstance that I received 'Up River' while I was doing my quick watercolors. 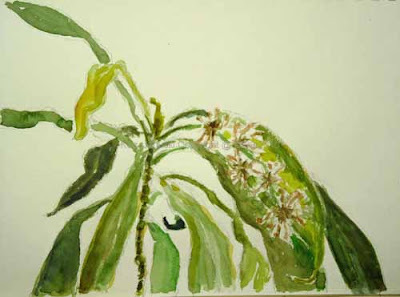 Their main purpose has been to get me to feel freer with watercolor so that the brush becomes as familiar as a pencil. It was just fortuitous that I got this book at the same time. All of which is a long-winded introduction to the watercolor sketches at the top. A few nights ago I realized that our cats seemed to be posing for me every night, just asking to be drawn. I didn't want to draw them but I thought it was an opportunity to paint them in watercolor. As you can probably tell these are done very quickly, often in less than a minute. They've been fun. 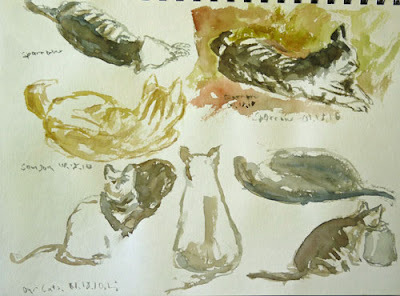 And besides having some visual memento of two of our cats, Samson and Sparrow, they're helping me to feel like a watercolor brush is just an extension of my hand. When we first started visiting Shenandoah National Park more than 10 years ago we had a hard time finding many warblers. As with any place the more you visit the more you learn where the birds are. 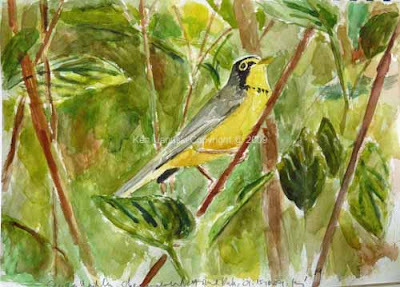 I remember when we saw our first Canada Warbler, and even more our first Hooded Warbler since its song was so full, rich and only a few feet away. These two bright yellow warblers have always been among our favorites, especially at Shenandoah. Over the years I've taken many photos of Canada Warblers. Once you get to know them you find that they're fairly gregarious, much more so than the Hoodeds we've seen. And yet almost all of the photos have been somewhat cold, more indicative of the gray back of the Canada Warbler, than the warm yellow of it's underside and face. But there is one photo that just glows. I took it last year and was surprised when I found that it actually turned out and that I actually had gotten the bird. I've held off on using it because I liked it so much I feared my artwork would never match both the photo and my memory of the day. Today was the day to give it a try though. I've been sneaking up on this for a bit. 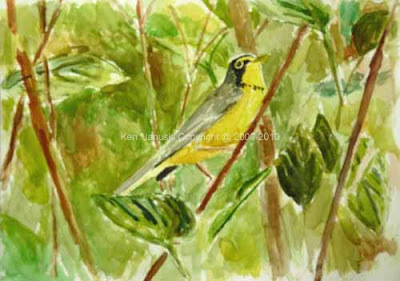 The detailed Canada Warbler drawing, the quick watercolors of a day or two ago. All inspired me with the confidence to give it a try. This watercolor is also on the lower quality paper that I use for my quick sketches. It's not real watercolor paper. That will be for another day. I'm not sure if this is done. It's sort of foolish to try to work this paper more than 30 minutes and I've already spent about 90 minutes. But I'm not completely happy with how the warbler exists in his environment. I think I'd like a few more details in the background. This morning, Saturday, I did make a few tweaks to the painting. The finished version is at top. I think that it is slightly improved. Below is yesterday's version. 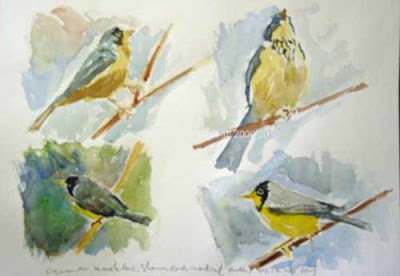 Following up on yesterday's quick watercolor of a Lark Sparrow I've done four very quick watercolors on the same page of various Canada Warblers seen at Shenandoah National Park in 2009. The purpose in doing these quick watercolors is really to get used to watercolor as a shorthand for representation. 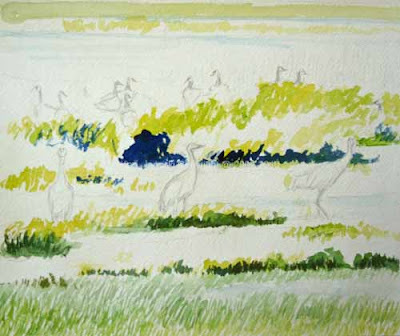 There are some watercolorists who work in such a way that there isn't much shorthand involved. They really try to get every detail that they see either in real life or from a photo onto the paper. But I have no interest in this. 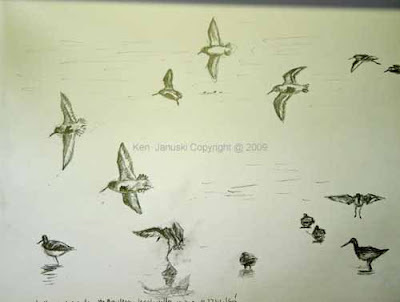 I have done it recently to some extent in some pencil drawings. But the purpose is really just to understand the structure of the bird more fully. When it comes to watercolor though its beauty to me is in its ability to use its own visual language to represent not just the subject, e.g. birds, but also the environment, e.g. light. This is not the time for another lengthy post on why I pursue watercolor, even with all its difficulties. 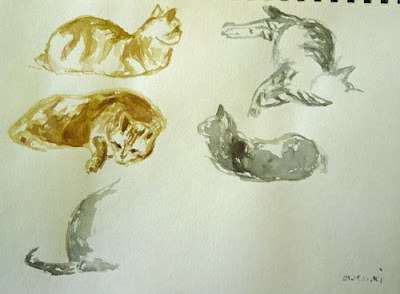 But I did just want to say that I the watercolors I most admire often seem to use it as language of visual shortcuts. Certain brushstrokes, abstract when seen just by themselves, become magically the wing of a warbler, when seen in the whole painting. That illusion is one of the marvels of painting I think, enjoyed by all as long as it doesn't become mannered and formulaic. So that is what I'm working on with these quick studies: learning the language of watercolor, learning to use broad brushmarks to indicate a bird all the while knowing that all sorts of detail is being deliberately destroyed as I do so. Each bird was done in 5-10 minutes. I've been very busy recently and have had to let my artwork slip a bit. I hope today begins the return to more time devoted to artwork. 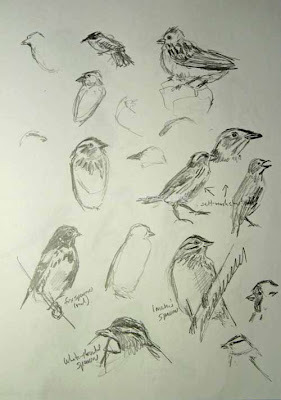 A few weeks ago I theorized that I might start doing some paintings and drawings based on sparrows. 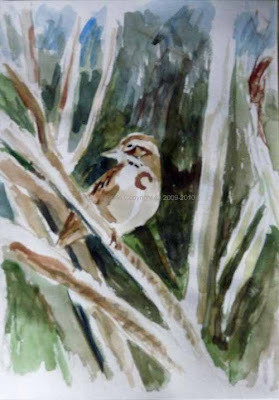 Some sparrows seem more common, or at least more easily seen, in winter. This isn't one however. It's a Lark Sparrow, a bird that we found along one of the ponds near the Hawk Watch at Cape May Point State Park in 2008. It was a lifer for us. 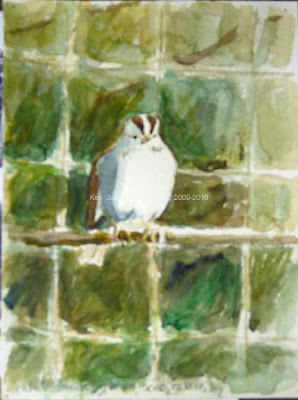 Though I took a lot of photos of this bird in 2008 and really wanted to do a painting I've held off. The photos were slightly overdeveloped. The bird was buried in a mass of branches. And it was hard to really see and understand its structure. All things that tend toward muddy and murky results. 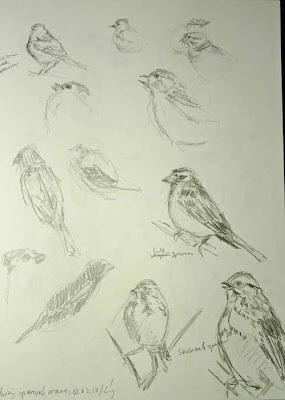 But my recent sparrow drawings, coupled with a desire to do a quick watercolor, convinced me to give it a try. So here it is. I do enjoy these quick watercolors, at least the ones I post here. They're done on paper that won't take much water or working so I just can't get too precious or spend too much time. Fifteen minutes is best. Thirty is possible, including breaks while waiting for paint to try. And any more is asking for trouble. The painting has to be done quickly. 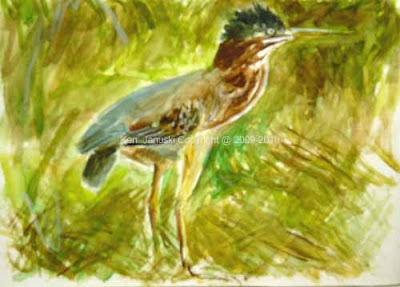 And in working quickly I get more familiar with watercolor and with portraying birds and their environment in watercolor. I hate to use the term, but it's a 'win-win' situation. It's been a very long time since I've done a more developed work. That will still happen. I just don't know when. In the meantime I continue to enjoy these quick watercolors. A couple things helped me to decide the title for this post: receiving a late Christmas present of 'Up River' by the artist Darren Woodhead, and spending five hours outside yesterday in 30 degree sunny weather counting birds for the Schuylkill Center Education Center Christmas Bird Count and the Philadelphia Mid-winter Bird Census. 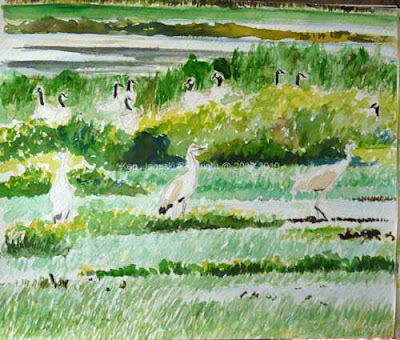 Darren Woodhead's wonderful watercolors of the natural world are all done on site, outside. Some are done as the snow falls. But all show the joy of being outside. Additionally the five hours spent outside yesterday were terrific. It was in the 20s when we started and I had to get up about two hours earlier than normal, something I really hate to do! Still there is something I find completely enjoyable about being outside in winter, even more so when I'm counting birds for a useful purpose, such as the CBC and the mid-winter bird census. It reminds me of what Ellen Snyder said recently in her Spicebush Blog: "Getting outdoors, bundled against the wind, is the only way to enjoy winter. " Perhaps it's the fact that we tend to get outside less frequently in the cold of winter that makes it so enjoyable. Regardless of the cause it's an enjoyable experience. I think that Darren Woodhead's watercolors crystallize this. Nothing can match the experience of being outside and creating art outside. Now I say this as someone who doesn't do so all that often. You didn't see me doing watercolors in sub-freezing weather yesterday. But it's good to have some artists who do. The liveliness and vibrancy of their work reminds me of how much art can do and how much art has to offer. The two create an experience of the natural world that I think is unmatched by anything else. As the natural world faces greater and greater threats, not to mention callous indifference, it's nice to see something that so brilliantly celebrates it. Europe lost much of its wilderness years ago. I can only hope that America will do better, especially as more and more reasons are constructed for its 'wise use', i.e. its destruction. One of the small pleasures of yesterday and of most winters is rediscovering the beauty of the fairly commmon White-throated Sparrow. It's brilliantly white throat is a pleasure to see each winter, along with all it's other striking coloration. It's one of life's small pleasures. The quick watercolor above is based on a photo I took yesterday. Perhaps one day later this winter I'll work up the nerve to try it live. One of the less enjoyable parts of living in a large city is that your yard birds may be dominated by House Sparrows. Though they never appear as the most prevalent bird in Cornell's Project Feeder Watch results for any given year there is no doubt that they outnumber other birds in our yard by about 10 to 1. I suspect this is true for most urban yards. That doesn't mean that a great variety of birds can't be found in large cities. They can. The green areas that do exist in cities can act like magnets, especially for birds in migration. So in winter I look at a lot of House Sparrows, and more recently Juncos. And yet I have the hardest time in the world drawing them. 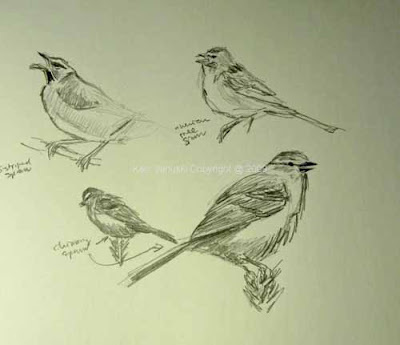 I suspect my attempts to draw from life over the last three years might have not sputtered out so quickly if I'd had subjects other than sparrows. Why? I'm not biased against them. In fact over the recent years I've developed quite an interest in them. The problem is that they're just LBJs(Little Brown Jobs). More than that they're LSJs(Little Shapeless Jobs). Not that they don't have a shape, sometimes even an elegant shape. But when seen quickly before they flit off all I tend to see is a blob. So over the last few days I wised up a bit. 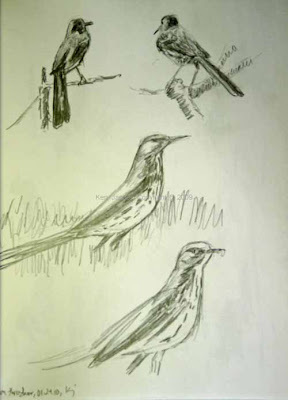 I drew from 'Watching Sparrows' by Michael Male and Judy Fieth. 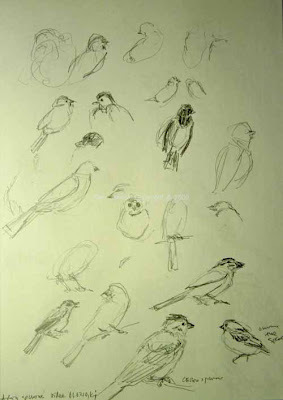 My thought was that by looking at enough sparrows, and trying to sketch them I'd finally get some idea of their structure. And I did. I still need a lot more practice but I feel like I'm finally getting some idea as to how the head fits with the neck and body, how the feather tracts work, where the legs are, and how the tail attaches. All of this seems obvious until you try to finish off a sparrow whose bill and head is all you've drawn before he has moved off. 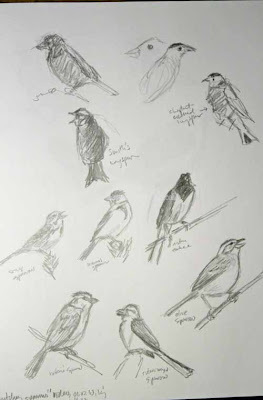 I started off by just sketching the sparrows at the speed of the DVD. But then I realized that I really had some captive sparrows. So I started pausing the video. All but one of the enclosed drawings is based on stopped video. It doesn't beat being outside with real birds. But it is a good substitute in 20 degree weather with strong winds. Or we might see an Easter Bluebird as our first blue bird of 2010 when we go out birding later today. Both might be around though the Eastern Bluebird is far more likely. 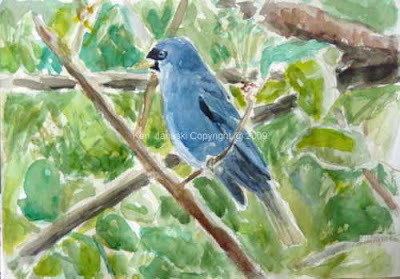 In any case this Indigo Bunting seemed a fitting emblem for wishing a Happy New Year for 2010! 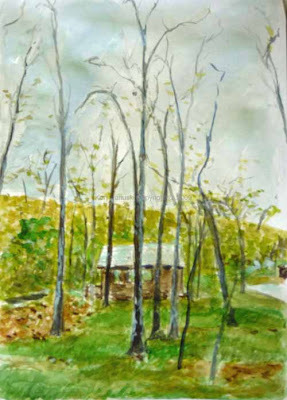 It's a quick watercolor based on a photo taken at Shenandoah National Park last spring. We concentrated on him while we waited for the resident Yellow-breasted Chat to make an appearance. Much chatting but no appearance sad to say!